Major League Soccer's annual All-Star Game is taking place Thursday in San Jose, where the league's stars will take on the English Premier League club Arsenal. 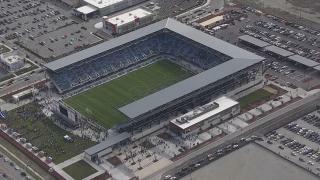 The AT&T MLS All-Star Game is scheduled for 4:30 p.m. at Avaya Stadium, the San Jose Earthquakes' new home that opened in 2015. The MLS squad features players from previous U.S. national teams, including the Seattle Sounders' Clint Dempsey and the Earthquakes' Chris Wondolowski, as well as Didier Drogba, best known for his time on Chelsea in the English Premier League but now playing for the Montreal Impact.